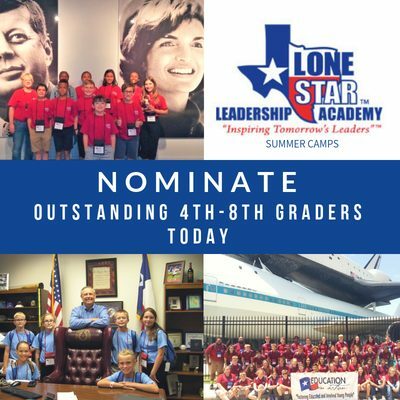 Nominate your outstanding 4th-8th graders for summer 2019 Lone Star Leadership Academy camps! Participants travel to the Dallas/Fort Worth, Austin/San Antonio, or Houston/Galveston area to join delegations of other distinguished students from across Texas for a week of fun, learning, leadership development, and visits to significant Texas destinations. Nominees must be in 4th-8th grade, maintain an 85 or higher average, demonstrate leadership ability, and be involved in school/community activities. Education in Action hires outstanding Texas educators to facilitate summer camps. Apply online.